Nonprofits of all kinds need grant funding to do their work, but competition for grant dollars is fierce. 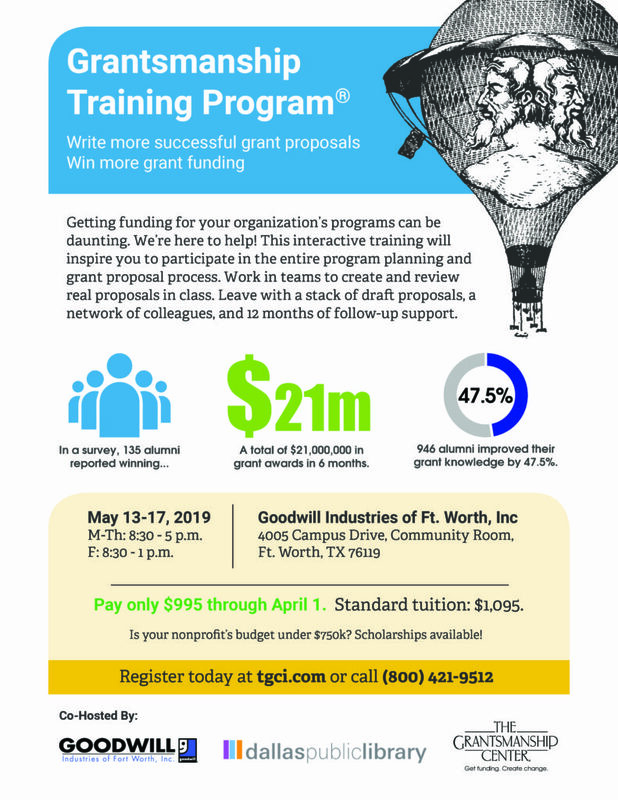 To help nonprofits win the grants they need, Goodwill Industries of Fort Worth and the Dallas Public Library have come together to bring the Grantsmanship Training Program® to Fort Worth the week of May 13-17. Class size is held to 30 participants. Early Bird Tuition is $995 until April 1. After April 1, tuition is $1,095. Half-scholarships are available for a limited number of qualified organizations. Register, get more information, or apply for a partial scholarship by contacting The Grantsmanship Center at (800) 421-9512 or www.tgci.com or registrar@tgci.com.